Why is this accident considered historically significant? This incident is considered the first accident between an automobile and a train in the United States. When, where and how did this accident occur? 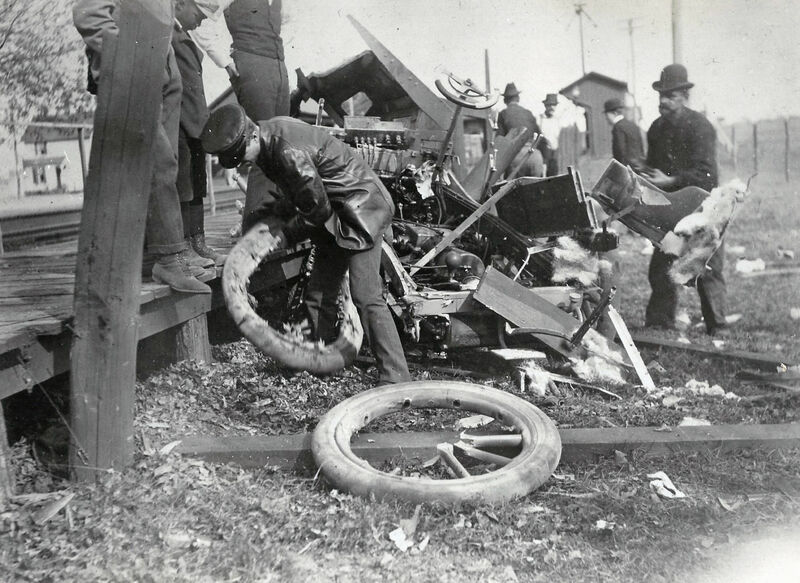 The accident occured on October 30, 1910 at the Long Island Railroad crossing on Post Avenue in Westbury. 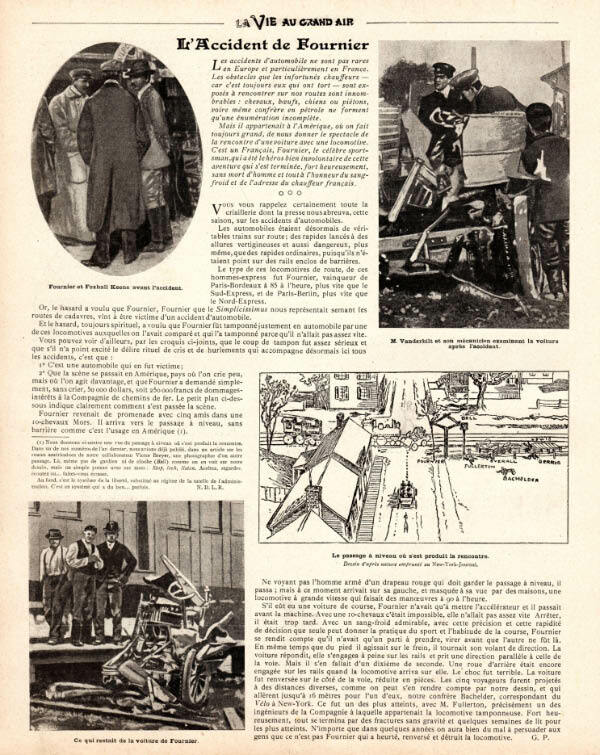 The accident was thoroughly described in the article "The Deadly Railway Crossing" published in the November 2, 1901 issue of Automobile Topics provided by Ariejan Bos (see below Bos' Bonus). 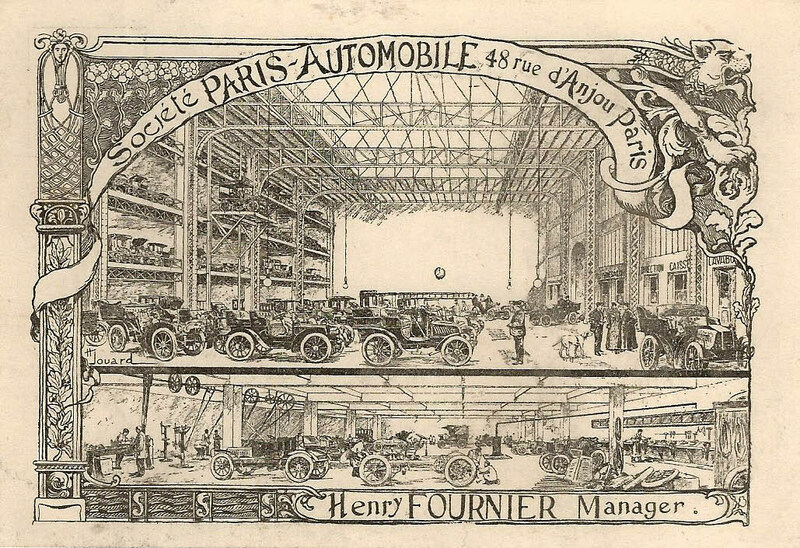 The driver was Henri Fournier, a successful French race driver, and later a car dealer for Hotchkiss and Itala. The four passengers in the automobile with Fournier were: H. B. Fullerton, a special PR agent for the Long Island Railroad, A.G. Batchelder, J.H. Gerrie, a New York Herald reporter, and Arthur Lewis. As described in the below accounts, Fournier and all the passengers survived the accident. 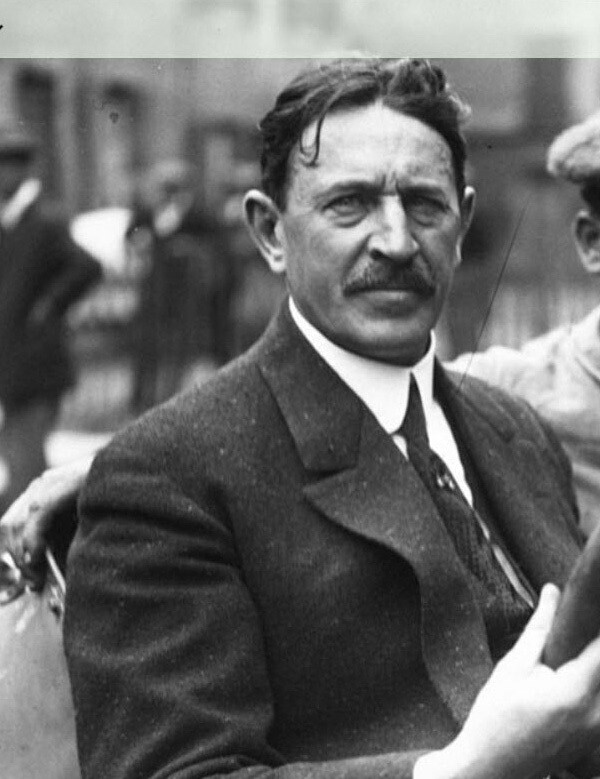 Link the driver to William K. Vanderbilt, Jr.
On July 31, 1902, William K. Vanderbilt Jr. participated in the first Belgian Circuit des Ardennes in a Mors racer that was owned by Henri Fournier. 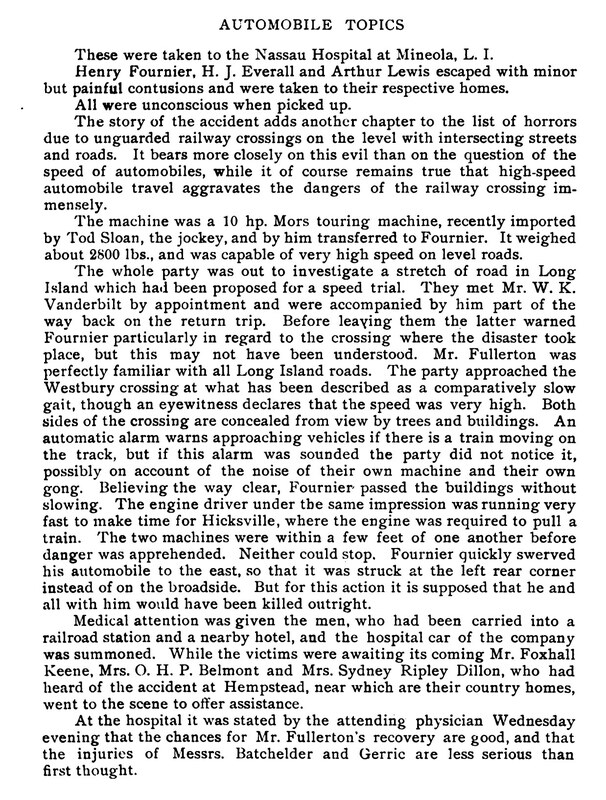 On the day of the accident, Fournier and his passengers met with William K. Vanderbilt Jr. to "investigate a stretch of road in Long Island which had been proposed for a speed trial." 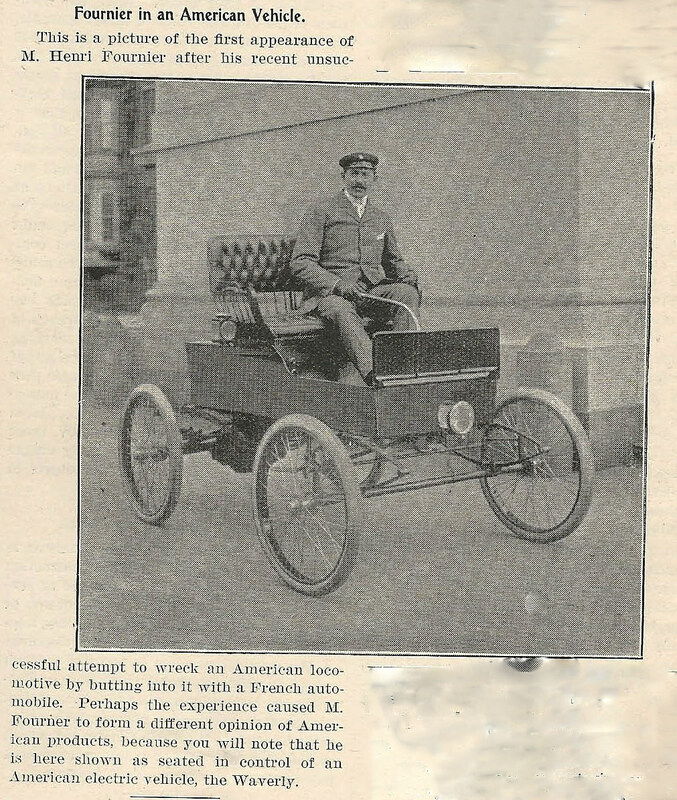 A yellow 10-HP Mors touring automobile which was "imported by jockey Tod Sloan and transferred to Fournier." Congrats and kudos to Ariejan Bos for completely solving this weekend's Mystery Foto (see below Bos' Bonus). Courtesy of the the Helck Family Collection. Ariejan Bos Update 9/27/2016:Today, I also realized that Fournier's accident should have been reported in the European press too. I forgot to look there. 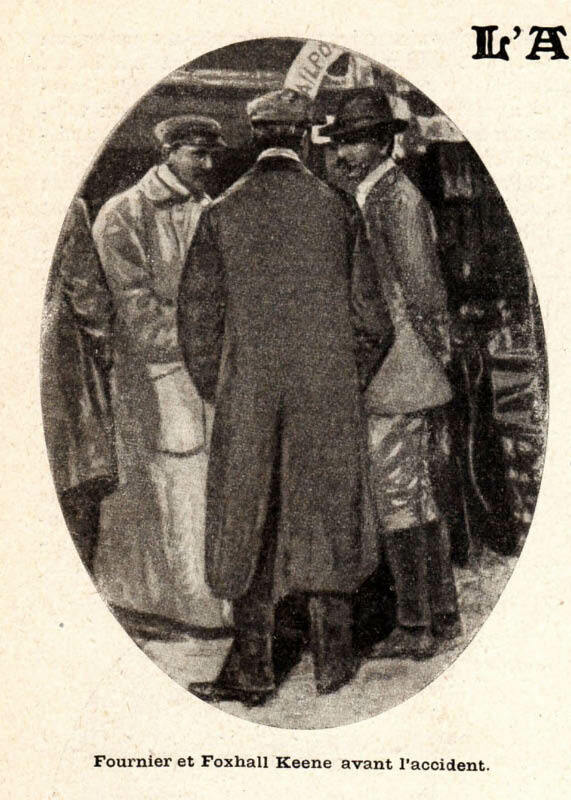 So this is the result, an article from La Vie au Grand Air, dated December 1, 1901. I will send a translation later. The article gives a detailed account of the accident, including a drawing of the location of all the injured men after the accident!! 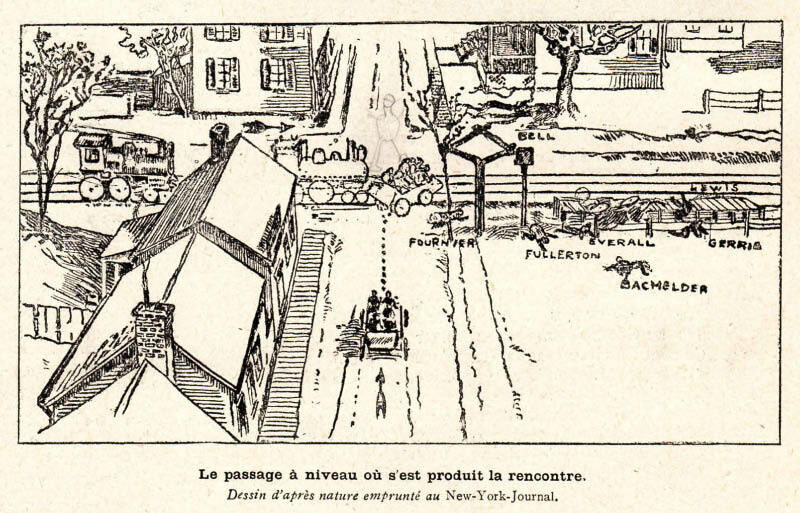 Of course, Fournier was the hero (it was after all a French magazine). A shot in the dark. It appears to be near a set of tracks, and the car appears to have been hit in the side or from 3/4 back. In looking around for Long Island auto train crashes in the 1900’s I could only manage one find. So I will go with this, but obviously the chances are low this is it. The only information I find on this is that the driver was G. Winthrop Sands, a stepson of William K Vanderbilt, Sr. Accident happened while on a trip from Dieppe, France to a castle at which the family was staying. Sands allegedly driving at 75 mph. Hope I have the right accident. 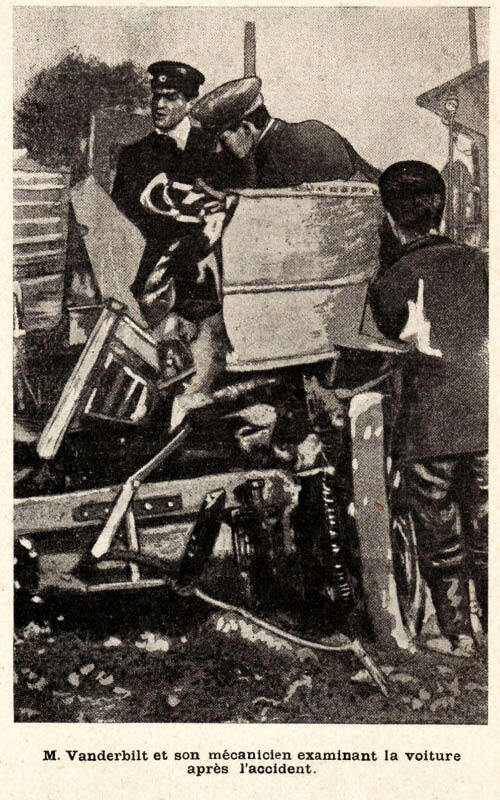 It took me some time to realize that the remains of the wrecked car belonged to a 1901 or 1902 Mors. After that the search became rather straightforward. 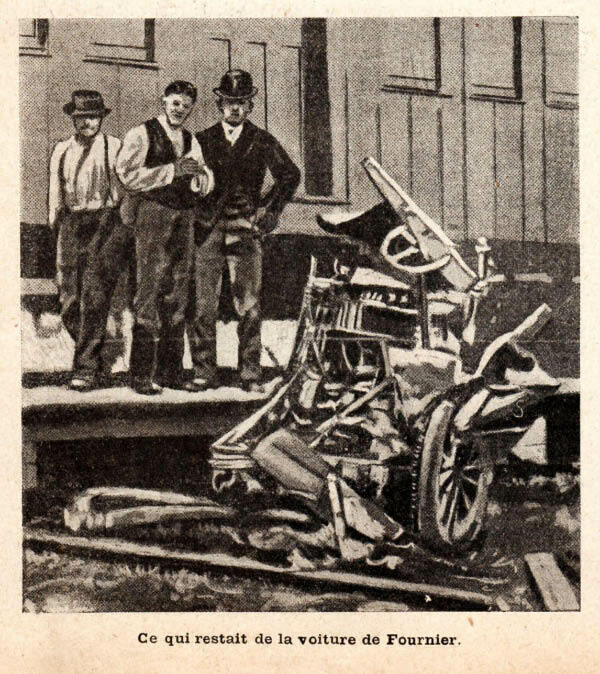 What we see are the remains of Fournier’s Mors, which was struck by a train in Westbury, Long Island on Thursday, October 30, 1901. It was recorded as the first ever train-car collision, at least in the USA. It was a serious accident, as the car had 6 occupants of which 3 were seriously, though not fatally injured. 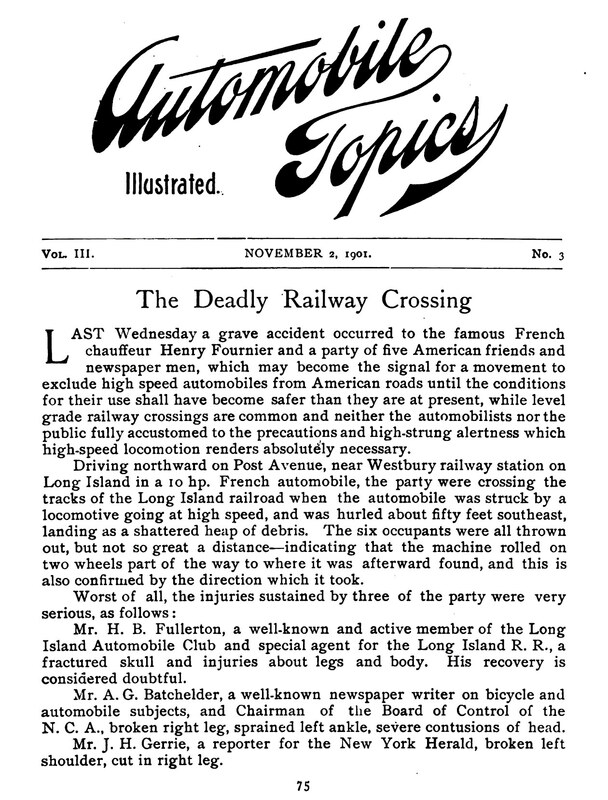 As you can read in the article from Automobile Topics William Vanderbilt Jr., whom they had met shortly before, had warned Fournier already for this apparently dangerous crossing. As always thanks for all the wonderful stories and images posted on your website! And of course congratulations with the donation of the Peter Helck Collection to your archive, in my opinion a very valuable and important addition. First racer to be hit by an LIRR train? Just a guess. 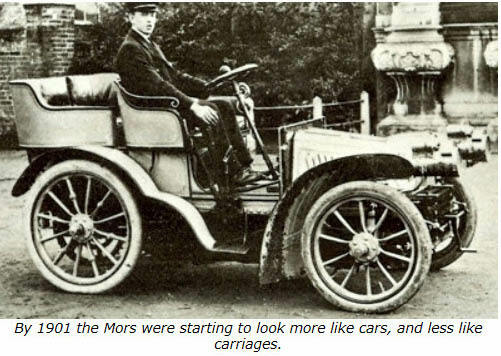 First horseless carriage fatality involved accident with a train. Why is this accident considered historically significant? - Howard says so. When, where and how did this accident occur? - When the driver tried to beat an LIRR train to the crossing and lost. Who was the driver? - Some poor schnook. Identify the automobile - a total wreck. Wild guessing, looks like an accident with a LIRR train, not auto. Judging by the wreck I don’t believe there were any survivors. Looks like a train station/platform/semaphore in the rear. This accident may have triggered the beginning for RR crossing gates. Didn’t even notice the railroad tracks. I didn’t look very good did I? Appears they were all ejected. Amazing all survived. Wow! Train slowing for the station was in their favor. Something went wrong here even with early warning of the RR Xing. The train wasn’t slowing down, on the contrary: it was even speeding “to make time for Hicksville” as can be read in the Automobile Topics article. And it was not a train, by the way, it was only the locomotive, which was supposed to pick up the train in Hicksville. Thanks Ariejan again, nice detective work. Using Chuck’s link above I found an earlier train/auto wreck at same crossing in 1906. This horrific accident had no survivors. Puzzling is that four years later, no bell or guardsman was stationed at this busy crossing.